The Blade X Max won't blow you away in the spec department, but it's not bad. Here's what you get. The Blade X Max will definitely be a big phone with a 6-inch display, but the bezels don't look too chunky. It will be rather heavy at 196g (6.93 oz); the Nexus 6 was only 184g. The combination of 1080p and a 3,400mAh battery should mean solid battery life, though. It's also nice to see 32GB of storage when most cheap phones still default to 16GB. Props to ZTE for shipping this phone with Android 7.1.1. Even Samsung and LG can't seem to get that figured out. Cricket will start selling this phone tomorrow (May 12th) for $150, but new customers who port in a number can pick up the Blade X Max for $99. 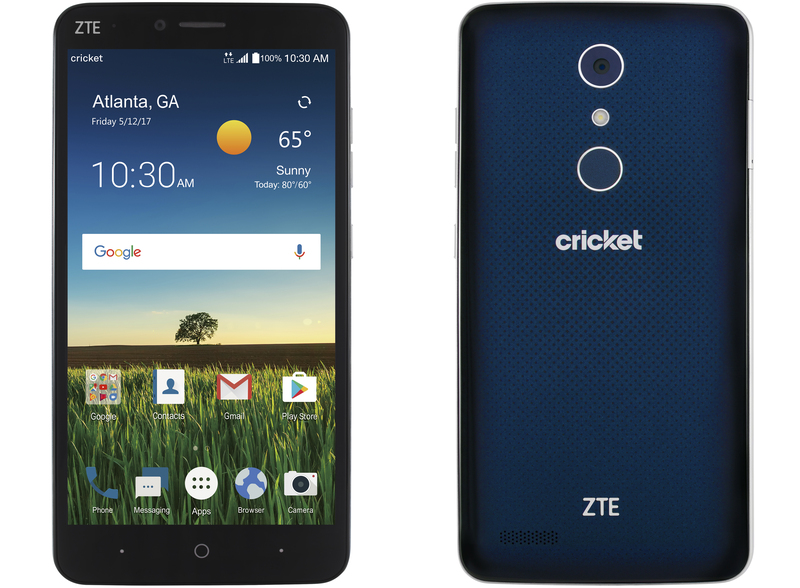 Richardson, Texas – May 11, 2017 – ZTE USA, the fourth largest smartphone supplier in the U.S. and second largest in the no-contract market,* today announced that it has brought its wildly successful Blade smartphone line to Cricket Wireless with the introduction of the new ZTE Blade X Max. Packed with in-demand features like a large 6-inch Full HD screen and a big 3,400mAh battery with Qualcomm® Quick Charge™ 2.0, the ZTE Blade X Max is available in stores and online at Cricket Wireless starting tomorrow, May 12th, for only $149.99 MSRP. The Latest and Greatest Operating System: The Blade X Max ships with Android Nougat 7.1.1 so you can have the latest and greatest Android OS in the palm of your hand. Superior Entertainment: With a large 6-inch Full HD screen, Dolby Audio and FM radio support, the Blade X Max can stream or play almost any type of content so you can watch your favorite shows on a big-screen, experience enhanced video streaming with optional DirecTV Now service, or listen to your favorite band no matter where you are. More Ways to Capture Life’s Moments: Take amazing panoramic photos in both landscape and portrait mode using the Blade X Max’s 13MP rear-facing camera, and brighten up those selfies by using the Camera Screen Flash functionality for clearer and brighter pictures. Security with Quick Access to What Matters Most: Incorporating a rear fingerprint sensor, the Blade X Max secures your important data while providing the ability to save up to five fingerprints to access different applications instantly at a touch. Performance and Battery-Life that Keeps Up with You: A 1.4GHz octa-core Qualcomm® Snapdragon™ Mobile Platform with 2GB RAM and 32GB ROM, expandable up to 128GB via a microSD card, is designed to provide the power and performance that can keep up with you. And a 3,400mAh battery with Qualcomm’s Quick Charge™2.0 helps you charge faster to keep you on the move.